Payment structure to leave you the client comfortable in knowing you have not outlaid money prior to receiving any goods or services. We have a commitment to arrive on date given and apply a work schedule to provide you with the completion date using my own staff for installation work and a team of committed sub trades, friendly and focused on your needs. 30 plus years in the industry. The oldest established kitchen company in Ballarat. We are a member of the Housing Industry Association and also HIA Kitchen & Bathroom. There's more to Kitchen and Bathroom design than cabinets, taking into account lighting, colour, surfaces, budget, we listen and consider it all along with a good selection of cooking appliances is also vital. Kitchen hods that exhaust heat, steam and cooking odours also add to the reduction in the heat, reduce the condensation, and the smells that linger long after the meal is consumed. 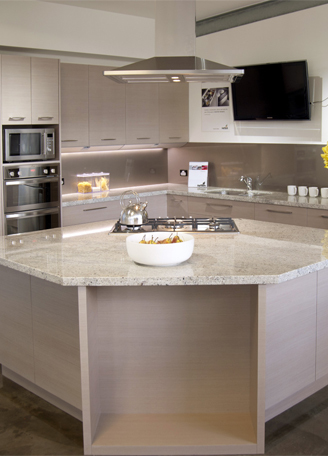 Realistic Kitchens, a family run company founded in 1978. Over the years Realistic Kitchens design, quality workmanship and meticulous attention to detail has highlighted its reputation as an industry leader not only in Ballarat but covering 250km radius. From Ultra modern finishes to heritage elegance or country warmth. Realistic Kitchens with its team design work closely with our clients to ensure that each and every project we undertake reflects the individuality of their lifestyle and needs. With numerous awards recognizing Realistic Kitchens, we will utilize innovative design and personalised service to take you all the way from Concept to Completion including all sub trades.